Let’s just jump to the heart of the matter: Why is Deviant Art such a garbage dump? What is it about fractal art, and especially the flame fractal category in particular that leads to the creation of these huge online wastelands of worthlessness? Oh yes, I have to acknowledge that there really are some flame images out there that are not garbage. I’ve collected about 10 so far and that’s (only) after browsing maybe 4000 thumbnails. Like I said in a previous post, I don’t mind scavenging for the good stuff, even when the ratio is 400:1. You can breeze through 400 thumbnails in about 15 minutes. The time required varies a lot of course depending on how promising the thumbnails look. If you have to frequently stop and check out something that looks interesting, that can really slow you down. For the most part you can travel at a pretty good clip, or click –show next page. Man. Even Cory’s got a lot of stuff there. Something like 700 and frankly, while agreeing with Jock and acknowledging Cory’s ability to make some of the best flame fractals, he’s got quite a few “also rans”, to use a horse racing expression. Whick raised the question: Is this just the nature of fractals? Is there always going to be such a wide range of “quality” wherever fractals are found? 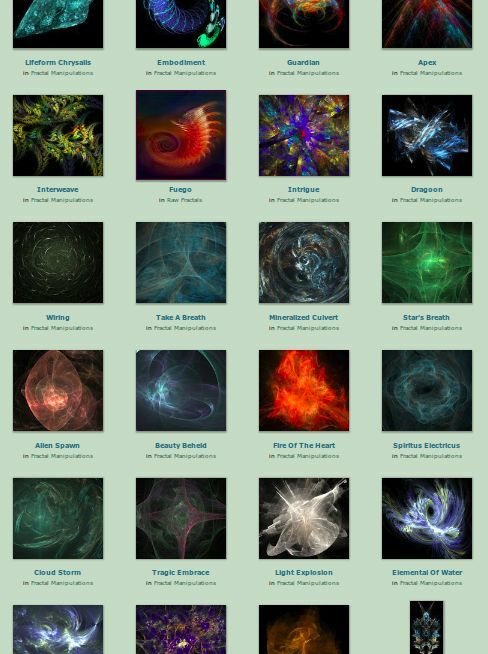 Don’t all fractal artists have “a lot of stuff” in their galleries? I went through all of Cory’s gallery, or galleries rather, mainly browsing the thumbnails. It was quite interesting to see the progression of his artwork over time. Cory’s best stuff is his most recent. Or has he just become more discerning and more selective in what he uploads these days? I’ve said before that all artists are editors and judges of their own work. An aside: Next to Mandelbrot himself, we ought to celebrate the guy who invented auto-generated thumbnails. Without those little visual samples we’d never be able to navigate the Sargasso Seas of the fractal world. You can tell an awful lot about an image from it’s thumbnail. And if there’s any substantial difference between a thumbnail and it’s full-size image, it’s usually that thumbnails make the larger images more appealing than they later turn out to be. Thumbnails are a good visual summary. I’m a garbage picker and nowhere is it more so than when I’m crawling over the heaps at Deviant Art. You know what gold miners do most of the time? They shovel dirt. It’s hard work but the chance of finding even a little bit of gold has caused people to dig away whole mountainsides. Gold miners are really dirt miners. 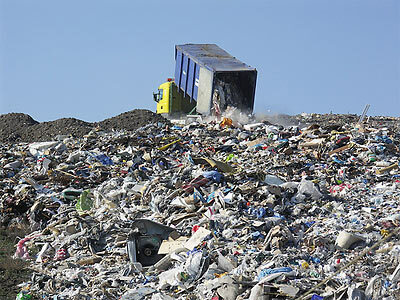 Garbage pickers are the gold miners of the garbage fields. 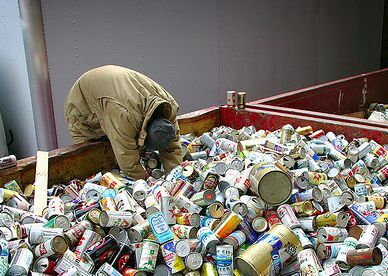 What the fractal world really needs right now is more garbage pickers. If you want to test yourself to see if you’ve got what it takes then try looking for good flame fractals on Deviant Art. If a place like that doesn’t make you want to give up then I, King of the Garbage Pickers, salute you! A new pile is uploaded: This could be the one, I just feel it! Finding good fractal art is like just like digging through heaps of garbage looking for useful or valuable things. The better artists are like rich people and you’re bound to find something to make it worth your while “browsing” their garbage. But what I’ve found is that the difference between the so-called “better” artists and the average, or even the worst, is not that great. Artists who make good stuff often make a lot of the other stuff, too. And the ones who upload endless pages of cheesy cliche images will eventually stumble on something noteworthy. I love it when that happens. The notion that good fractal art comes only from skilled and talented people (as the Fractal Art Manifesto claims) is simply not supported by my numerous trips to the great online dumps of the fractal world. Furthermore, this suggests that good fractal art is as much the outcome of playful experimentation as it is of any kind of ability or learning on the part of the fractal program “user”. Fractal art is an electronic toy; a paint-by-number machine. It’s only the grown-ups who want to make it into something big and important, not us kids. Anyhow, this scavenging aspect to viewing fractal art that I’ve been alluding to I think just reflects the same scavenging environment that fractal art is created in. We search parameter sets and search parameter variations looking for something that stands out –that catches our eye. We search large panoramas for signs of promise, something that’s different. The artists sort their work and the viewers sort what they’ve sorted. Everyone who doesn’t like junk is a judge. Even if you’re into post-processing there’s still a lot of experimenting and scavenging to be done. Post-processing entails the most searching and experimenting of all. It’s a natural extension to a fractal program: extra buttons. But why is there so much trash on Deviant Art? We’re getting there. Firstly, the making of fractal art is a lot of fun. It involves experimentation, exploration and sometimes just the challenge of taking someone else’s parameters and making something different with them. It’s a simple reflex to save the image and later upload it to some site like Deviant Art or Flickr: Each upload represents some sort of accomplishment to the artist. That is Deviant Art and most other art sites in a nutshell. This is why there’s so much “garbage” piling up in places like Deviant Art: artists want to share their “accomplishments” where the possibility of getting a reaction is possible. If they lack objectivity and think everything they’ve made is great, or fail to notice how much their own work resembles the truckloads that have already been uploaded, I think they can be forgiven. At least they we can shrug off the “offense” of spamming the gallery or posting images that are random batch renders (I loved that feature of Apophysis when I first tried it out). The average Deviant Art user is self-absorbed and seeks recognition. The uploaded artwork reflects that self-indulgent, short-sighted and emotionally driven creative context. 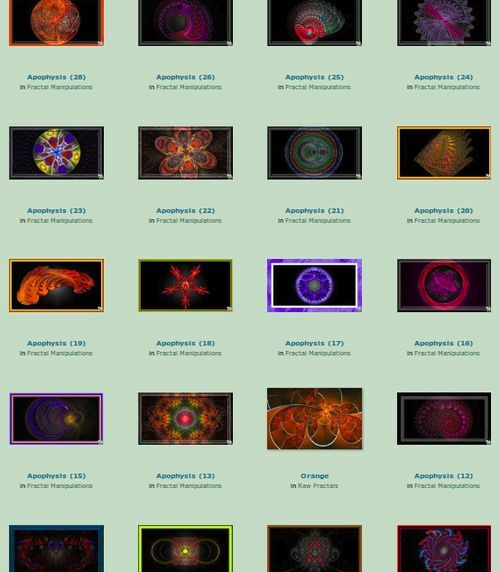 The uploads aren’t for the benefit of the general public to come by and get acquainted with fractal art; rather it’s the kitchen fridge analogy that some commenter here on OT years ago pointed out. Kids are proud of what they’ve made because they made it. And parents (or in this case, your online buddies) are (almost) as excited because of the relationship they have and because giving compliments makes them and everyone else feel good. I’ll bet cave painters got the same sort of comments from their friends as the folks on Deviant Art do today. The whole thing is just the result of human nature and the ageless urge to create because it’s a fun thing to do and it’s a social activity as well. Bigger things like “art” and “innovation” are not what these sites are all about. They’re very personal and thus very trivial and that’s why one needs to approach them with gloves and a shovel, a sharp eye and a critical disposition. What then should be done about these trash factories? Firstly, Deviant Art is not some charitable enterprise set up to encourage and nurture young artists. Deviant Art is a money making operation. So the people running the whole thing don’t care so much about the quality of the artwork as they do about the quantity of people attracted to it and the commercial spinoffs it creates, like art sales, advertising and paid memberships. I mean, think about it. Why does Deviant Art (or Flickr) exist in the first place? Those motives have a lot to do with explaining why the place is so member-focused and so inclusive. It’s primarily the needs of the members that generates most of the income. Deviant Art makes money off it’s membership, not people like me whose primary interest is looking around. They might sell more prints though if they had, perhaps as a separate section, a more selective collection of artwork. But I’m guessing that they’re reluctant to embark on any kind of sorting endeavor for such a massive amount of artwork. And placing upload restrictions on it’s members would only spawn a new site where those restrictions didn’t exist. Besides, features like “favorites” galleries go a long way to sorting through the trash even if some artists game the system. Sites like Deviant Art will always resemble a landfill site and the only chance for most people ever seeing the better stuff is plain old word of mouth advertising. The Favorites sections do this somewhat when they’re not too large, but beyond that they’re very few critical venues where the more interesting fractal artworks can break of out obscurity and get the sort of attention they deserve. The contests at best are too infrequent and display too few artworks. At their worst they’re horribly biased and choose work that should be thrown back on the heap instead of being held up for all to see. You know, Orbit Trap is probably the best friend Deviant Art ever had. Look how many artists and artworks from there we’ve pointed people to. And we’ve inspired a lot of “journal” postings too, I hear. No need to thank us. It’s payment enough just to be able to roam those flaming, smoking heaps at will and dig for gold where no one has ever dug before. Or may ever dig again. You are getting closer to the heart of the matter. deviantArt is a dumping ground in every single category not just fractals. It follows the formula that got us from handmade to mass produced. Where does one go if not to dA? I remember when I first started posting on Renderosity probably 10 years ago. I was posting three images per day (that was the limit for free users), and I was always very proud of them. They were rubbish.